Cure: When did you discover digital art? On a visit to see my family in Ohio, my brother showed me a drawing program on his Apple II. The pixels were as big as the fingernail on my pinky (Apple lo-res graphics) and it was completely keyboard-driven (left-left-left-change color-plot pixel...). Nonetheless the proverbial lightbulb exploded over my head. Before that moment, I had had little interest in computer games except for the table-based Centipede at my favorite East Village muffin store. I knew of no one who created art on the computer. I had no idea how to start, where to go to learn about it. It felt like I was throwing myself off a cliff. But I couldn’t shake the excitement generated by the potential of an unexplored frontier. I finally found a course in computer graphics at the New York Institute of Technology. I was completely unqualified but the professor thought it was important that artists get involved in the field. I still have the course textbook, Principles of Interactive Computer Graphics by Newman and Sproull. I was so naïve that I tried to read bits of Pascal as though it were English. A classmate named Örlof took pity on me and explained what a programming language was. I sold my first illustration to my old ad agency (left). The so-called “high” resolution mode on the Apple II was too coarse to get all the detail needed in the illustration. 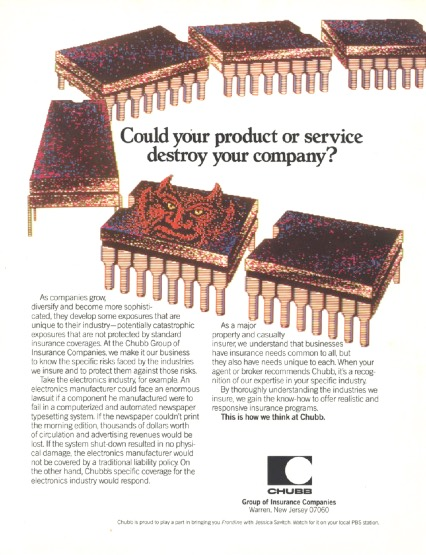 So I did six separate illustrations of computer chips at different angles – one of them with a devil’s face emerging from it. The images were combined by hand on film. 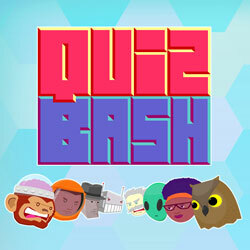 That launched my freelance illustration career which gained speed as more clients wanted the unique look of pixelated art to stand out and signal their up-to-the-minuteness. The educational market was more fun, though not as remunerative as advertising. I did many illustrations for Scholastic’s Microzine series of interactive discs for kids (bottom left). These were static page-flipping images. To create images to be animated, I had to plot them on graph paper by hand for the programmers to recreate (Mona Lisa, Edison, Ada Lovelace, below). File size was always a major limitation on digital-only work. It was something to be negotiated. C: How long did you work as a digital illustrator? 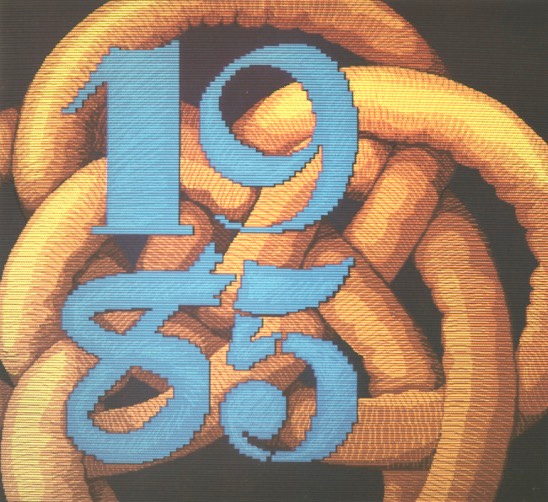 L: I worked as an illustrator from 1981 until 1990. My timing could hardly have been better. I recall a nightmare in which I was sent to hell for enjoying my work too much! In the ‘90s, I moved into interactive work and UI design. C: What drew you to digital art? 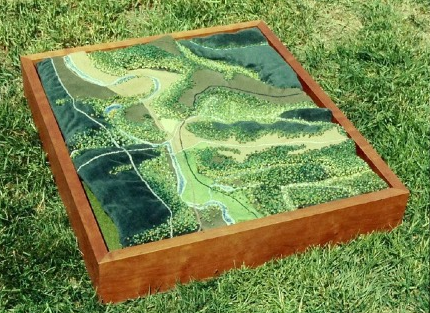 tree was created by a French knot (Cuyahoga Valley Map, below). Beading and macramé are raster-like, developed over Cartesian grids. I had an affinity for taking a restricted palette and limited technical means and pushing them as far as possible. I had also experimented extensively with a color Xerox machine after hours in the art supply store where I worked after college. C: You mentioned the "woodcut quality" of early Apple II art in the Micro Live video. Do you have a background with printmaking techniques, and did that (or other experience with traditional art) influence how you created digital art? 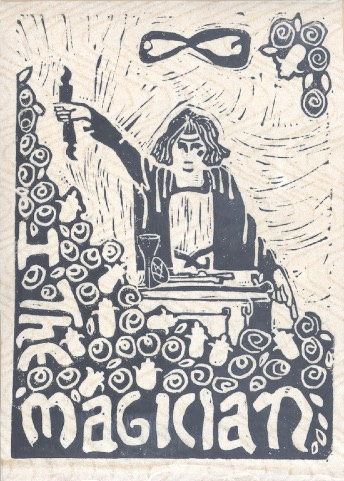 L: Not much although I had done a number of linoleum cuts (The Magician, below). I thought the reference to woodcuts was more understandable for the audience than had I talked about French knot trees and macramé. C: Was the Apple II the first computer you made art on? L: The Apple II was my first computer art tool. 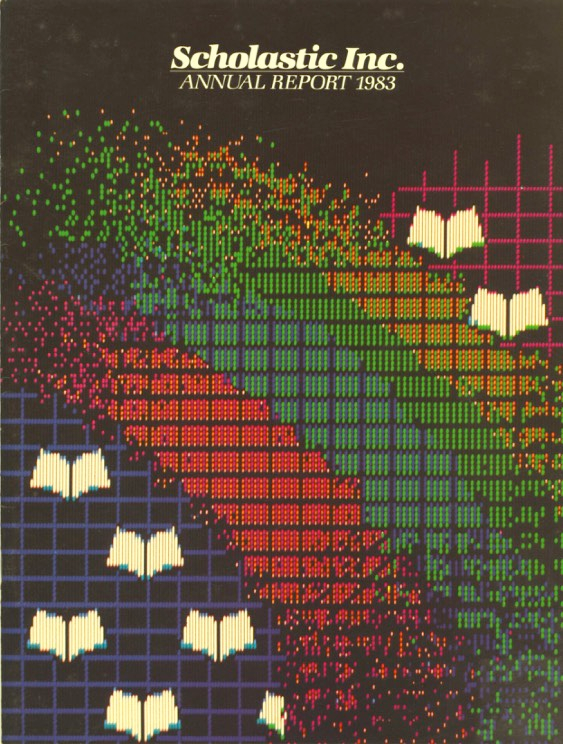 In the 1980’s those of us in my New York circle who worked on Apple IIs called ourselves “Pixel Pushers” because of the way Steve Wozniak enabled additional colors to be displayed on Apple II high-res graphics. The screen was divided into 7-pixel wide columns, and within a column, each pixel’s color could only be from the same color group: green/purple/white/black, or blue/red/white/black. This created rough, ugly fringes where the two groups met, making it difficult to create shapes the way you wanted them. We spent a lot of time trying – often in vain – to work around that limitation, fiddling with our drawings. Hence “Pixel Pushers” since we’d end up pushing a pixel from one color group to the other and back again until we found the least-worst version. 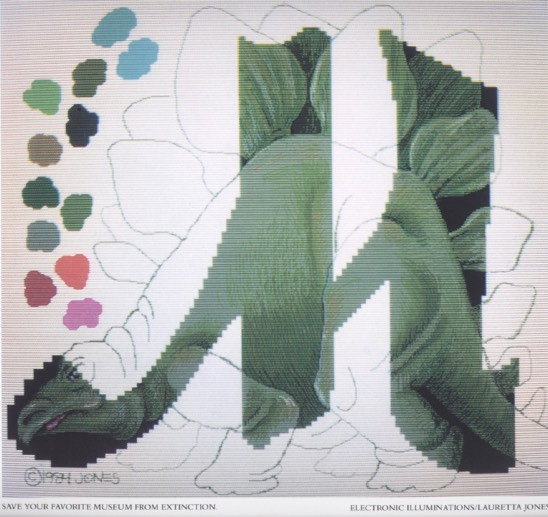 The fringing imposed a strong style as did the dithering of pixel colors to achieve a pointillist-like illusion of additional colors (Scholastic Annual Report Cover, below.). Yet the illustrators I knew at that time were still able to carve out many unique styles within those constraints. Another thing influencing style was the difficulty of getting images from the screen to the printed page. We took 35mm slides off the screen or mailed files on 5 1/4” floppy discs to a service. Both results changed the image. The trade-off was between clean, straight lines with harsh color and fuzzy parallax with good color. This increased resolution – new to client’s eyes at that time – was almost too smooth to say “computer”. So in the calendar, I created an homage to the computer’s low- resolution heritage by adding “stairsteps” or “jaggies” to the letters and numbers. I drew them first on the Apple II without the Number Nine board, and then enlarged and imported them into the higher res system. 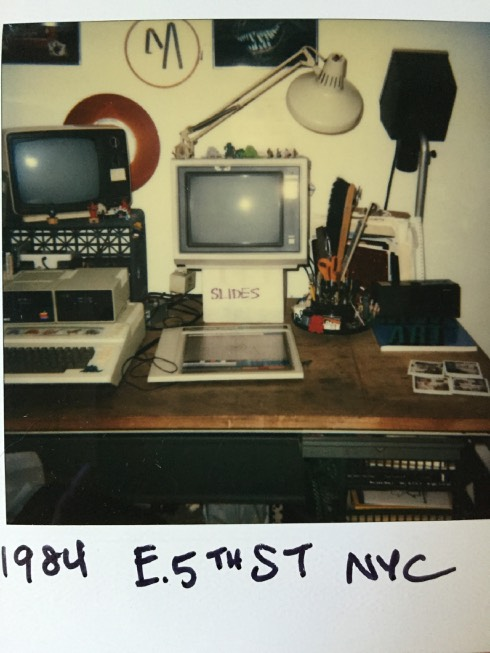 Also in 1985, I began teaching at the School of Visual Arts in Manhattan and had access to IBM PCs. I tried many programs on the PCs, but the interfaces were all clumsy and annoying. I resented the time I wasted in the classroom teaching students to use an interface at the expense of addressing concept, composition, drawing, etc. That frustration eventually steered me into user interface research because I thought it was clear that programmers were not taking users – the artists – seriously. In addition to my commercial work, I exhibited in pop-up galleries in downtown Manhattan, in shows associated with computer conferences and at universities. The regular gallery circuits were unaware of or actively ignored us. It didn’t help that there were scads of art-challenged but technologically savvy people who suddenly decided they would create “art.” So the quality was extremely varied, a lot of it very poor. 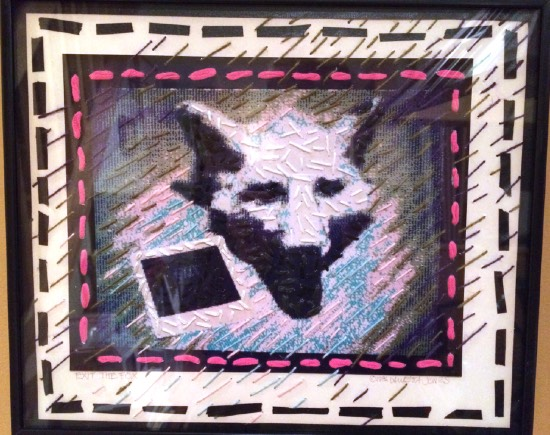 I also exhibited a series created with Thunderscan – a scanning device that replaced the printing head on the Apple ImageWriter dot matrix printer. 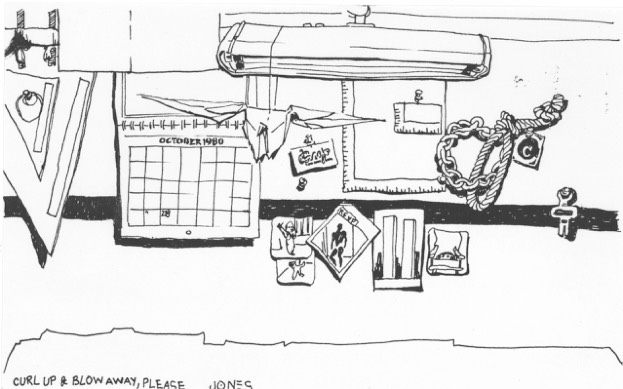 I began with pen-and-ink sketches from my notebooks which the 1-bit scanning process endowed with a graphic, pixelated quality. Fluctuations of light on the paper added random textural effects – a bit like a monoprint. (Manhattan Rooftops, below) I displayed them as 18” x 24” photo enlargements. In the exhibits, some artists displayed work on monitors, but it was rarely more than passive slide shows. Some argued that electronic displays (CRT in those days) were the “natural” environment of computer art, but I found it too restrictive. C: "When I’m using a mouse my fingers are useless. I end up drawing with my arm, shoulder, and even back muscles." to emulate a natural drawing style? L: The first Apple tablet was a wonderful, natural device. I spent my life developing hand-eye coordination with pencil-like tools; why would I give up all that subtlety and control? 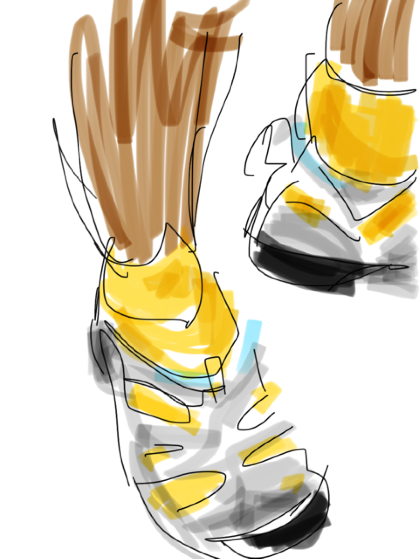 I never drew with a mouse if I could help it. Once in a while I’d be forced to use a particular program that had no tablet driver. The work definitely suffered. Not to mention my neck and shoulders. C: I understand not all of the art in those days was made with raster-based pixel pushing. What role did vector graphics play in the early days of computer art? 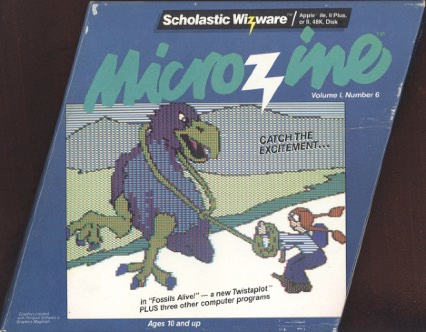 L: We used vector-based “drawing” programs for interactive disk-based work (such as Microzine) because creating an image as a series of x/y pairs and code calls enabled us to save a lot of disk space – which was our most precious commodity. I drew my illustrations on paper which I taped to my graphics tablet and then traced as a series of connect-the-dots vectors. The published disk included the graphics driver to interpret and play back the drawing file. If the disk displayed the computer’s image memory on the screen as the vector instructions were read out (it didn’t have to be – the image could be reconstructed in memory and displayed to the user only once it was complete), you could use that to do a bit of pseudo-animation by being clever in how you constructed the drawing. That could be a lot of fun. On the other hand, when you were creating the image, there was no interactive editing of a point. If you needed to revise a shape or change a color fill, you had to rewind/replay the vector image to the point where you wanted to make the change! It was a different variety of pixel pushing, I guess. 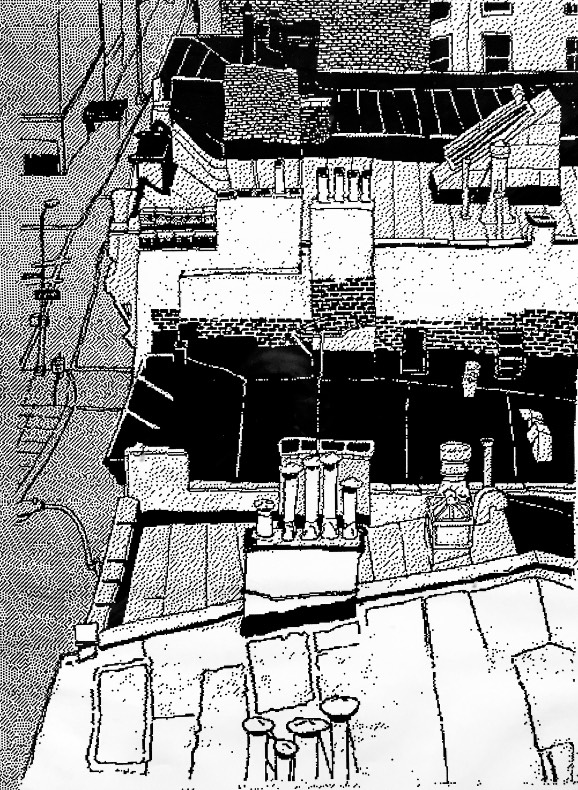 Looking at the Microzine images and the 3x5 notecards I kept on each project reminded me that the drawing programs somehow had more colors and didn’t suffer from the same fringing issues of the bitmapped “paint” programs. The final images may look like today’s Pixel Art, but that was due to the limitations of the displays. It didn’t matter much what tools we used - the size of the pixels and the limited palettes made everything look similar. C: Pixel artists today often argue over what sorts of digital art should be classified as "pixel art." I think you summarized it well with: "once [the resolution gets] much past 512 you can't tell that it was drawn with a computer, and to me that quality is part of what I want in my drawing, that's what's interesting and exciting to me." Was there a point (or gradual process) where you felt digital artwork shifted its focus on individual pixel placement and began to evolve into other styles, or was being eclipsed by more sophisticated techniques? L: There was a point – it crept up gradually – when the screen resolution and tools got so good that the computer became simply another tool for design and illustration. It began replacing traditional design tools and illustration media. Once the market shifted and expected me to use the computer as a production tool, to meet tighter deadlines (for less money), make endless changes for the art director and hide the computer’s inherent qualities, I lost interest. For me that took the fun out of it. My response was to turn to interactive pieces and user interface research for the same reason that drew me to computer art in the first place: to explore what the computer could uniquely do, and for the opportunity to explore and contribute to a young field. To do that, I had to face the question of whether I would become a seriously good programmer or collaborate with others. I chose the second route. In 1988, I worked with colleagues Tim Binkley and Tom Alonzo from the School of Visual Arts to create interactive systems commissioned by the IBM Gallery of Science and Art in Manhattan. We installed versions in three other museums across the country. “Face to Face” (tablet interface overlay, above.) brought the fun of creating what we today call “Selfies” to the public. People took pictures of their faces, distorted and them and took home print-outs of their work. Next I joined a group working on user experience at IBM Research. We created a network of touch-screen systems for visitors to the EXPO’92 World’s Fair in Seville, Spain. 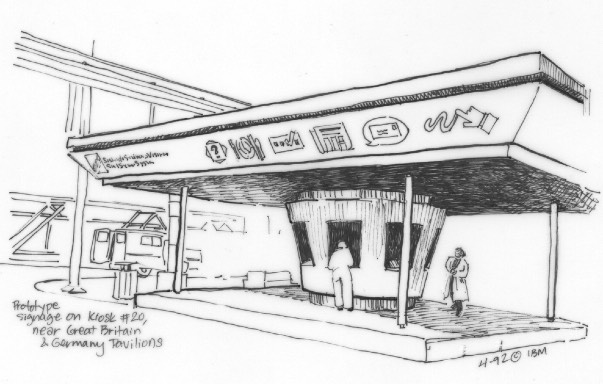 (My sketch of one of our kiosks below.) It had a host of services that we take for granted today – news, restaurant reservations, way-finding, opinion polls, voice and picture messages. In 1992, it was unique. C: What do you think about the world of pixel art today? Has its form or function changed in any unexpected ways? L: The original era of computers as image-making devices was a precious tiny blip of time. The limitations of the technology available to us then directly imposed an aesthetic – love it or hate it – on our imagery. Yet, as we now have a broad array of electronic devices with displays of varying resolution and computing power, techniques used in the 1980’s remain relevant. I don’t see that the form or function of pixel art has changed as much as the experience of the maker. A pixel artist today has a choice to work within those limitations or to create art on more powerful systems. At the same time, I find some of the new pixel art a great deal more sophisticated and more richly informed by art and society than our work was. 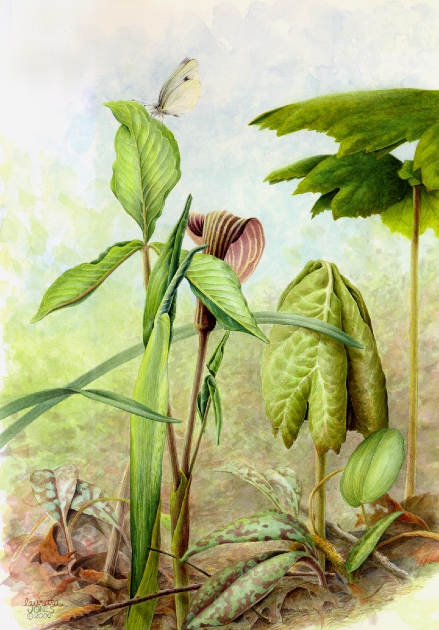 C: An interviewer once said "botanical art was the perfect antidote to her career in computer graphics. She grew weary of the speed at which her virtual world turned and opted out." What drew you away from digital art? Was it the technological arms race that constantly altered tools and methods? L: I have a saying pinned to my cork board: “Life is too short to spend on only one thing.” The early days of computer art were very heady. We were on the edge inventing stuff and we knew it. We were a small community with great camaraderie and excitement was always in the air. That withered with the maturation of the tools, and although I found bits of it again in big team projects, the endless cycles of change and competition to create the newest thing began to feel repetitive. At first, I turned to watercolor painting simply as a diversion, but I eventually came to value its slowness as the ultimate luxury. One has to be slow and quiet to really see anything in nature, and also to see as an artist, to get beyond the shortcuts of our visual system. I love having the opportunity to watch nature do the unendingly fascinating things it does, to play with physics through the quirks of watercolor pigment slowly drying on paper. C: We began the interview with an observational drawing you made at your desk job, before beginning your career as a digital artist. After years creating pixel art, often with surreal or fantastic themes, you’ve returned to observational art. What compels you to capture the world around you, particularly the natural world, and was this desire ever frustrated by the limitations of pixel art? L: I am endlessly fascinated by the natural world, especially its hidden details. It began as a teenager when my boyfriend astounded me by identifying leafless, winter trees by their buds and bark. I hadn’t imagined that was possible. I sometimes feel that I am Alice and – having fallen down the rabbit hole – am trying to bring out what I’ve found to share with the world. Much of my art grows from the same impulse: “Hey, look at this!” Surprisingly (to me), I never thought of combining my love of nature with my art until I stopped using the computer to create images. Initially, it may have been due to the inability of the tools to portray the level of detail by which I was captivated. Also I was always more interested in trying to find what the computer could do that other mediums could not. C: You seem to have painted every species on the planet capable of photosynthesis. Do you have a favorite subject? L: Well, not even close, of course. 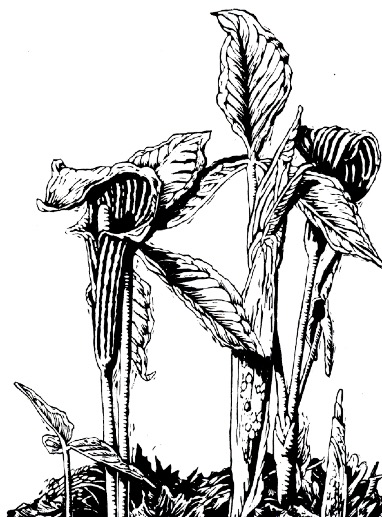 I am particularly drawn to the arum family – specifically to the familiar Jack-in-the-Pulpit. I also prefer subjects that don’t change so quickly that I cannot draw or paint them from nature. Hence my spice series. Photographs are often necessary as adjunct references, but one must be aware that photographs lie, distort and conceal. And that’s even before they get into Photoshop. C: Lauretta, thank you so much for taking the time to share your work and your insights into such a pivotal era in the history of pixel art. L: You are more than welcome, Logan. This discussion has been an unexpected and delightful opportunity for me to relive those days. You can download the original PDF format of this interview here. Thanks Cure! It never fails to amaze me how people approached pixel art as a medium back in the day, and the beautifully crafted first works of pixel art that shaped our understanding of what pixel art is today. After speaking with Lauretta, I've learned that she does have all of her original pixel art, but it's stored on 5 1/4" floppy discs. For those who didn't get to experience this tech, those are the floppy discs that are as big as your face and actually floppy, unlike the later 3.5" "floppy" discs that had hard plastic shells. If anyone has a computer rigged up to read 5.25 floppies she'll probably send them to you. She also has work on 35mm slides, tear sheets of anything that was printed, and issues of Microzine, some still in the shrinkwrap. I can also forward any particular questions y'all have to the artist and let you know what she says. Very inspiring, thanks for this! I'm surprised, at that time (81) there was already a graphic tablet and graphic editors, for example in Japan artist like Kazuko Shibuya or Takashi Tezuka (or Myamoto himself) they had to paint the pixels with mouse or with the keyboard and that each input was a color, which occupied the memory of the game. Thank you Cure for the interview and for the documentation of one of the first pixel artists. MrHai: Interesting observation. I guess the difference is that today it conveys retro nostalgia vibes, whereas then it looked like cutting edge technology. She was making pixel art before it was pixel art ! Thank you, thank you, thank you for doing this! 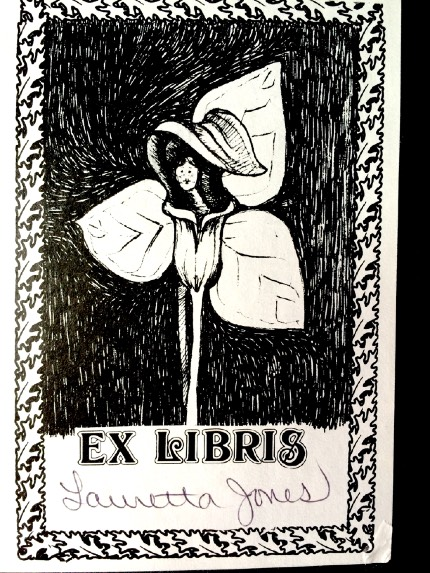 Loretta is amazing! I love how innovative they had to be back then. And, to tell the truth, we are all still benefiting from the processes these "pixel-pushers" went through to accomplish difficult compositions. I thought about the early scanner she used. Such effects are created easily with threshold settings that many programs have, but she was not only stuck with those results, but also was thoughtful enough to appreciate what was happening. It gives us the chance, now, to realize that it may have been adding to the creation and enjoyment of those pieces. I can't wait for the movie! ...but seriously, someone needs to make a pixel art documentary. What a fantastic initiative! Great interview Cure, this made me very happy to read. Apart from the data on pixel art history, what this makes me feel can be described as nostalgia, and I love it. I think everyone who's into the retro feeling of PA (and who here isn't?) should read this. Thank you cure for your important historical research in pixel art, and thanks for reaching out to Lauretta. It is a wonderful interview and I had great pleasure in reading it!